In our last post we wrote about the next stage of the foundations. 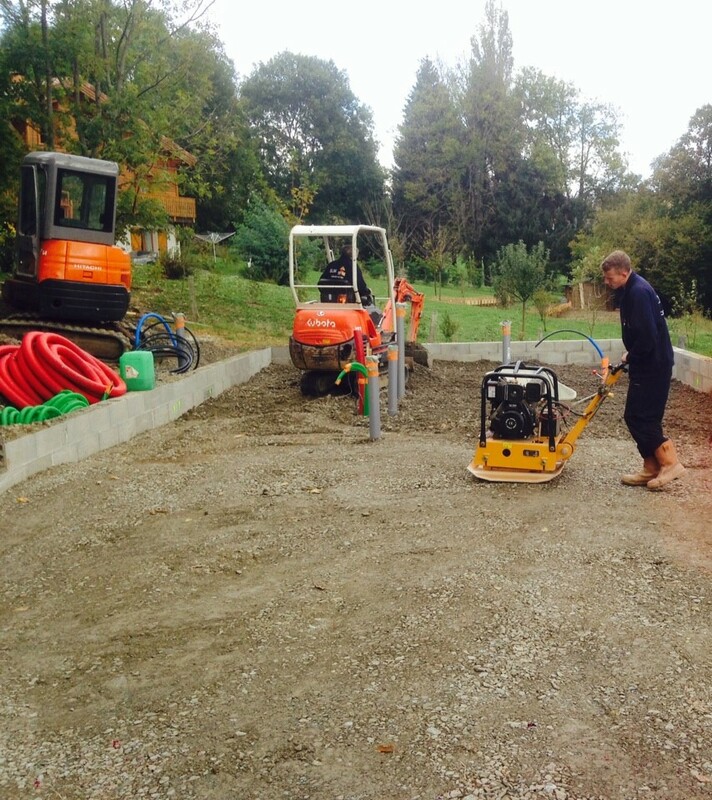 The middle (where the chap is working), has, as we said been dug out and filled with gravel. He is now compacting this down ready for a new delivery of gravel. This will continue until the are has been built up enough. The pipes you see in the background are for electricity, water, telecommunications and sewage (hooray to be on mains drainage). View will look good from here! Service pipes – we all need them! The next stage in the process will be to lay the mesh and insulation and the top with the Agilia concrete. Agilia is supposed to be top stuff because it can be poured quickly and flows and spreads easily to provide an exceptional, highly aesthetic finish (so say Lafarge). If you wanted this could be your finished floor. For those of you that might be interested in this type of thing, here is a video from Lafarge explaining why it is so great – if you ignore the self promotion – you’ll get the idea! Since we last posted, we have also chosen our front door and insulation. Fortunately, this decisions were not too difficult to make. The much harder decisions (to roll top bath or not and how many cushions on the bed etc) come a bit later on! 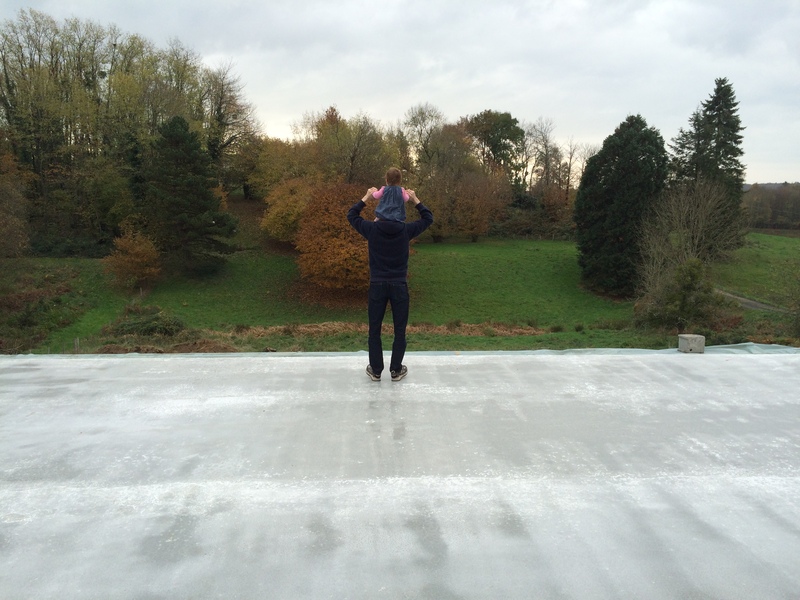 Either way, for now we are happy to see that the view from the house will be great and all the time we took aligning the house in the right direction looks like it will pay off! Categories: French House Build, House Construction | Tags: Agila, foundations, service pipes | Permalink. You lucky people, here is another picture of some concrete, but this time the picture also contains some blockwork walls! 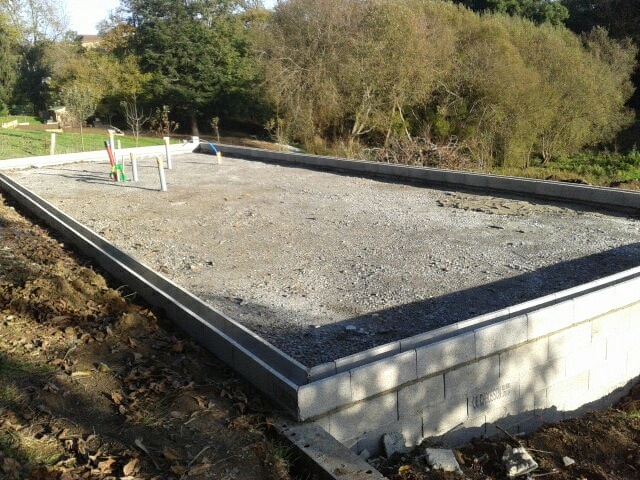 The foundations are coming on a pace and the shape of the house is beginning to show! We are also beginning to get an idea of what our view will be like. It is good to see that the builders have built the foundations in the right place! 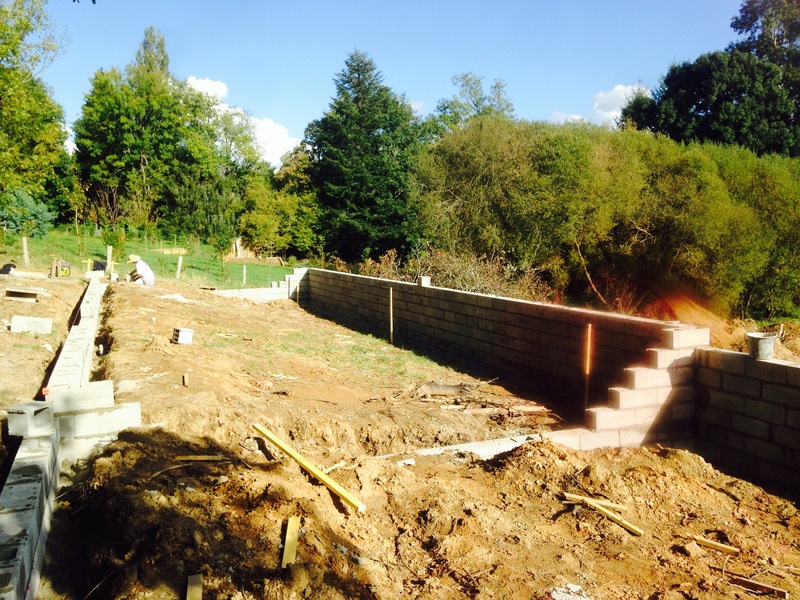 The blockwork walls are being built because they support the timber frame above. They will eventually be covered up with decking, so will fortunately not be visible. Over the next few days, the middle (where the chap is sitting) will be dug out and filled with gravel and then compacted, on top of that will be sand to make sure the damp proof membrane doesn’t puncture, then a damp proof membrane, then insulation and then the concrete slab. We will write more on this once the builders get that far. As you can see from the images below, the Charente is living up to its name as the second sunniest place in France after the Cote d’Azur. Categories: Construction, House Construction | Tags: blockwork, Charente sunshine, concrete, foundations, SLM construction, Tintin | Permalink. As promised, concrete! – Comme promis, le béton! In my last post, I hoped to show you something a little more ‘concrete’ when I next wrote. That time has now arrived! 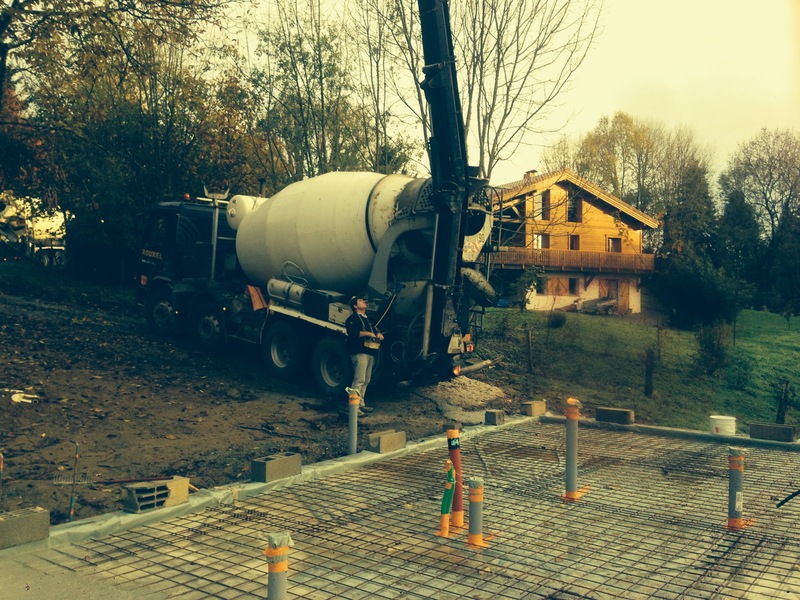 A big Lafarge truck turned up on our site today to deliver and lay a lot of concrete for our foundations. I know concrete isn’t the most environmentally friendly of products, but it was our best option and meant we didn’t spend a fortune ‘getting out of the ground’. 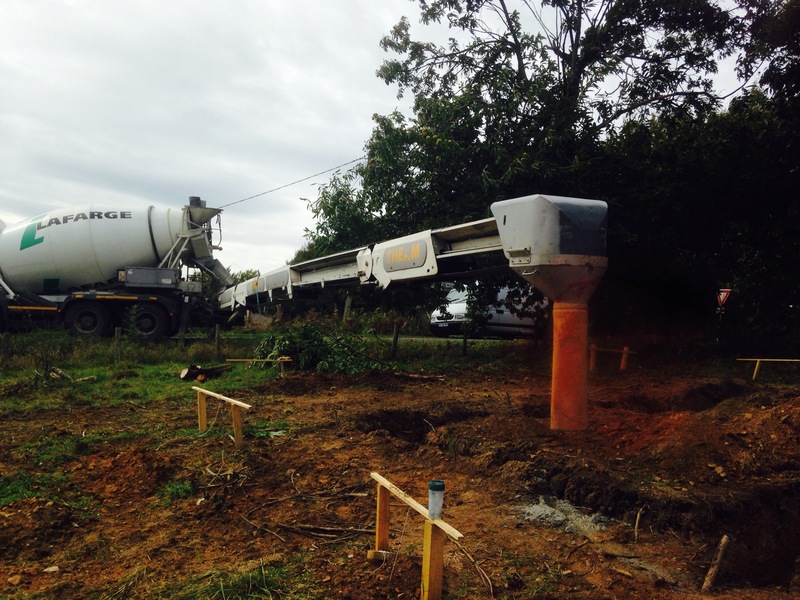 We will also be having a concrete slab, which is great for thermal mass, something which will be very important during those Charente summers. 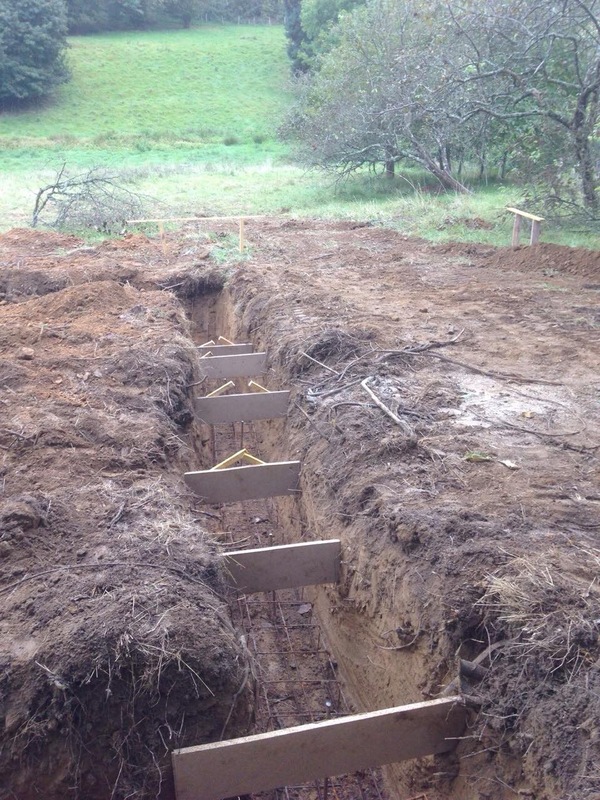 Anyway, this is the start of the foundations and is a very exciting moment in the build. It really feels as though it has started now and that we have officially ‘broken ground’. For me, it also gives an idea of the scale of the build for the first time. You always see people in Grand Designs standing in the frame of their house gawping at the size and scale of what they are building and now I am one of those people. I am sure that this will only be confounded once our frame goes up. What we are building isn’t huge, but it is good to get an idea. If you’re lucky, I will post more pictures of concrete tomorrow…. Categories: French House Build, House Construction | Tags: concrete, foundations, Lafarge, Thermal mass | Permalink. Rock stops play? Roche arrête le jeu? Fortunately not as it turns out! Our builders did come across some rock which I thought meant disaster when Tom first told me. I had visions of vast costs involved to remove that rock in some very unenviromentally friendly way – and that roll top bath becoming ever further from my reach. 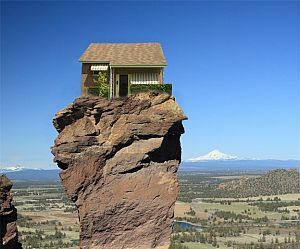 Apparently tough it would have been a good thing – rock being a good base for foundations. This could have meant a saving in the cost of foundations – that bath was on its way back….In then end, the rock was just in a small area and was nothing to worry about or be thankful for. 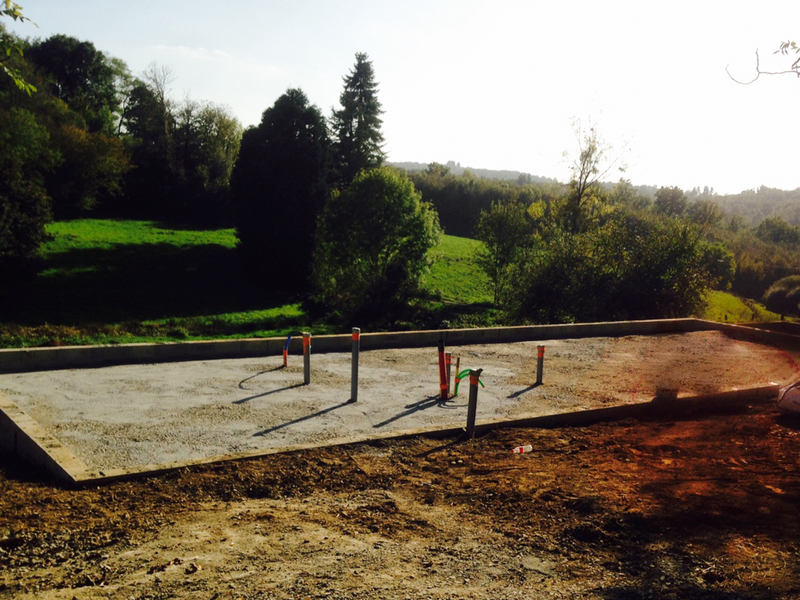 Our builders continue to make good progress and as the sun still seems to be shining in Montemboeuf, hopefully there will not be any delays due to bad weather. I just hope they don’t get the weather we’ve had in London any time soon, or that pool that we want will be built a little earlier than expected. The photo above shows the start of our foundations and Tom tells me the metal caging has also gone in which reinforces the foundations. I don’t have much more to say about that, apart from it is very exciting – more so than just your average hole in the ground with bits of wood in anyway. Hopefully in the next post I’ll have some photos of something more concrete as it were….. 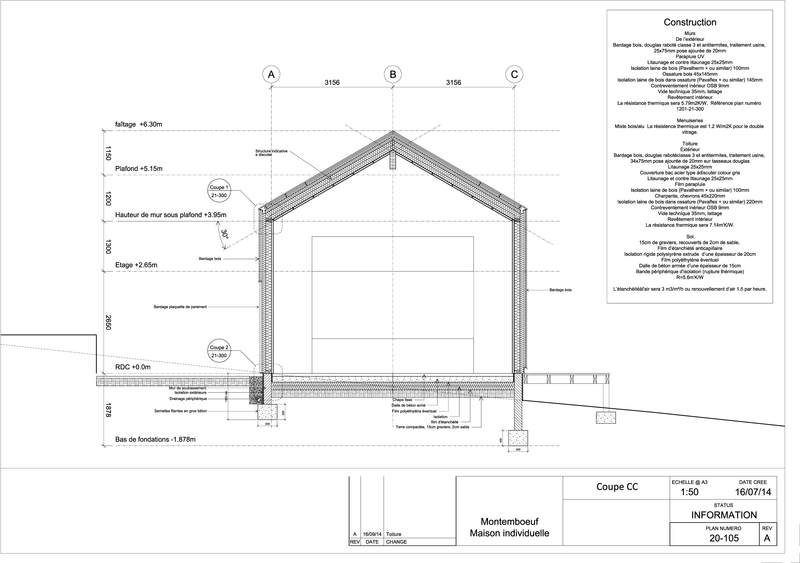 Categories: Construction, French House Build, Montemboeuf Plot | Tags: Charente sunshine, foundations, SLM construction | Permalink.